Please check with your physician as to which vaccine your student has not received. After receiving these vaccines, please bring a copy from your physician's office to your campus nurse. Providing proof from your physician's office of these vaccines to your school nurse prior to the end of this school year, will make your student's orientation in August go much smoother. The Comfort ISD School Health Advisory Council (SHAC) works to foster a culture of health and wellness for students, families and staff. Members consist of CISD parents, students, school personnel, and other community members. SHAC members meet 4-6 times a year to review Comfort ISD coordinated school health programs and make suggestions on ways we can improve the health and wellness of our Comfort ISD community. Why Do We Need a School Health Advisory Council? behavior to academics and overall performance. Schools play an important role in teaching lifelong healthy habits. 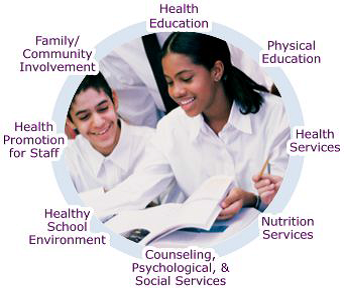 What is Included in a Coordinated School Health Program? If you are interested in becoming a member of SHAC next year, please see the CISD SHAC flyer below for more details. Once the form is filled out and received, you may be considered for becoming a member of the committee but final approval will be made by the district school board. Thank you so much for wanting to be involved.